As an economist focusing on energy and environment, I would like to give you some indications, what shape a sustainable energy future could have in the next coming years, why the future I project is a sound economic choice and what extraordinary challenges are ahead. The roles of hydrogen, oil, gas, coal and nuclear are reflected as these are he favorite choices of transnational companies and electricity monopolies. It took 150 years to develop the fossil fuel society we are in. In a little over a century, petroleum has grown into the most widely traded commodity in the world — some say, a narcotic — and into one of the prime drivers of violent conflicts. With the election of President George W. Bush, the petroleum system seems to have reached its summit from which a decline is inevitable, and this new direction indeed has already begun. Many theories have been spawned regarding petroleum in the ground and its practical availability above ground. 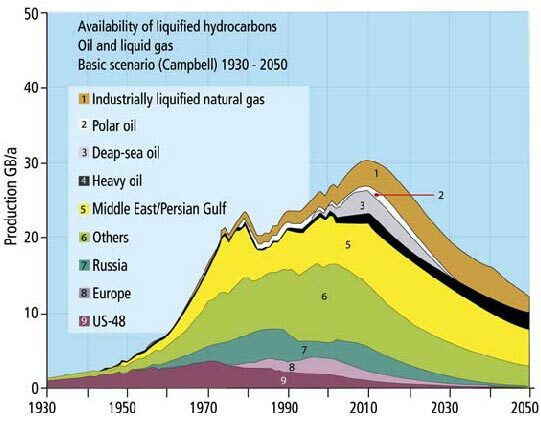 The most successful one came from the US oil geologist Marion King Hubbert, who in 1956 predicted that US oil production would peak in 1970 and decline thereafter. 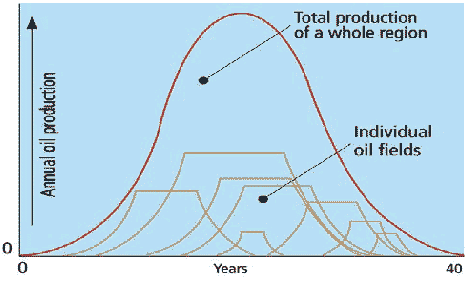 The “Hubbert Curve” illustrated above demonstrates empirical experience based on geology and statistics: The practical availability of a region’s oil reserves over time describes a bell-shaped curve, similar to the Gaussian (Normal) Curve. Large fields are discovered first, small ones later. After exploration and initial growth in output, production plateaus and eventually declines to zero. 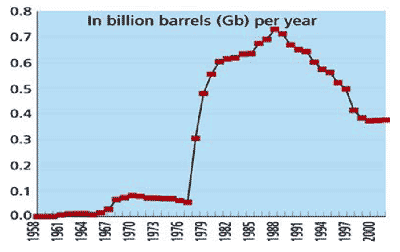 In the 1950s Hubbert predicted that global oil production would peak around the turn of the century. 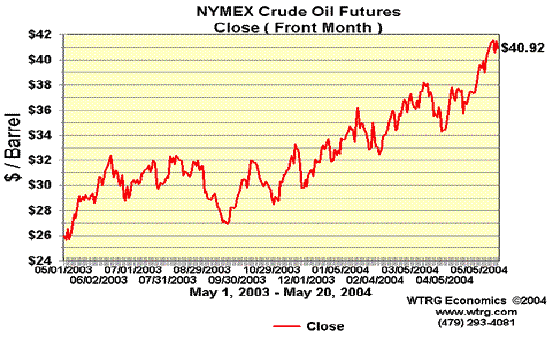 OPEC’s capping of output for some two decades delayed the peak somewhat. Until 1970 Hubbert was ridiculed and denounced by the US Administration and the oil industry. 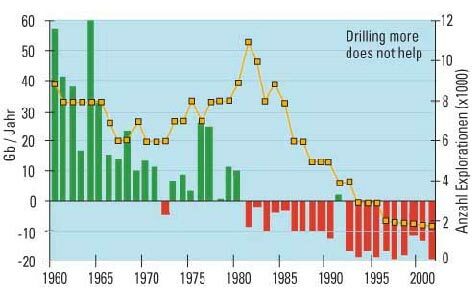 However, his theories proved exactly correct; beginning in 1971 US oil production declined and has maintained this downward trend steadily. The decline recently was slowed somewhat by tapping off shore and deep-sea oil deposits in the Gulf of Mexico. A steep decline in output is also to be expected there, roughly after 2010. Hubbert’s empirically derived forecasting methods have stood the test of time. Even today new exploration and production technologies can alter, but not undo, the limits dictated by geology. Alaska’s giant oil fields mainly were developed after the 1973 oil shock and began producing after 1978. Output reached its peak within ten years followed by the essentially symmetric decline. Samotlor is Russia’s largest oilfield. Oil production is declining steadily despite the deployment of secondary and tertiary production technology. The bell-shaped output curves work both for major fields and entire regions. Norway presents a similar picture. Production patterns for individual oilfields are particularly well portrayed in this chart. Each of these oilfields describes its own Hubbert Curve that ends up in a steady contraction. More drilling does not help. More drilling does not help. Output in most Non-OPEC nations already has passed their respective peaks. Even for OPEC members the situation is by no means rosy — Indonesia and Venezuela, for example, can no longer produce at rates to meet their OPEC-allotted quotas. Yet, the world’s reliance on lifting OPEC’s exports is actually growing because output of all OECD oil exporters has passed peak. 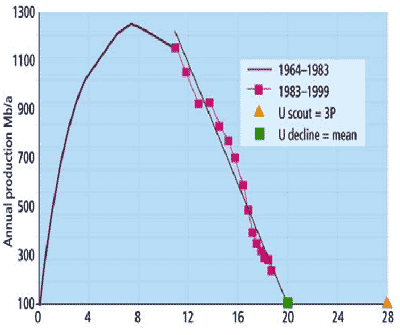 Efforts by the petroleum geology community to nail down the exact date of peak are interesting academically, but the real trouble begins with the loss of oil price stability. This loss is well underway. Price stability would be a reasonable expectation only if there were a good measure of excess production capacity. That is not the case now. 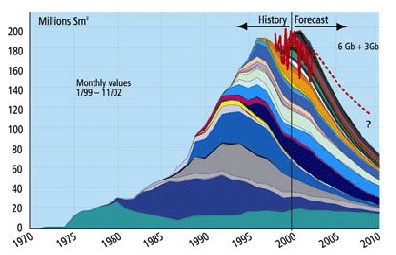 Spare capacity is only about 2 mbd — probably the lowest since World War II. 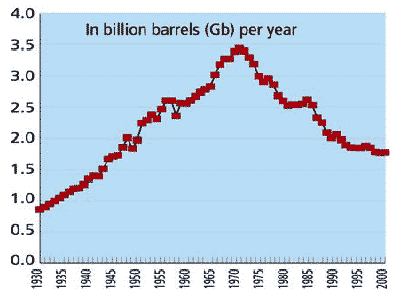 Oil indeed will continue to flow for another 75 to 100 years — but in steadily declining quantities. What’s critically important to understand is that the price elastcity of supply is no longer working as it might in other industries. Higher prices no longer can bring forth rapid and significant increases in oil output. 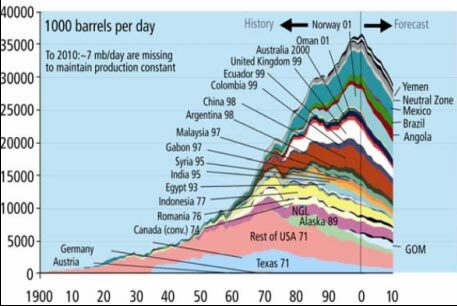 As early as in the 1970s it became clear that high prices ($80 to $100/b in 2003 dollars) might lead to much increased drilling but not to increases in oil discoveries. This time we cannot drill or militarily conquer our way out of this problem. Fig. 10: US natural gas prices 1930-2004. So oil capitalism will come to an end, an outcome that’s beneficial to climate stability. For consumers, however, this will be a bitter end with horrific energy bills, with wars over access to petroleum, with rising costs due to climate change — killer storms, droughts, floods and unprecedented high temperatures. More damage is to be expected. How will consumers react then? Prices rise to reduce consumption. From a physical perspective it is astounding how inefficient industrialized nations work. In the power sector, 70% of the energy is wasted even before you get it to the home, office or factory, where additional waste occurs. For the conventional gasoline internal-combustion engine, well to tank combined with tank to wheels, accounts for a total loss of 88 percent. This is great news in a bizarre way, since it means there really is a large untapped efficiency resource. Take the example of coal energy from coal mine to coal power plant to transmission system to incandescent bulb. You arrive at an energy waste of about 97% of the original source . New LED technology has a very high Lumen/watt ratio. The same applies to many industries — motors, computers or cars, so with higher prices expect these resources to be tapped! Correctly evaluating future developments requires proper tools for measuring inputs and outputs. With rising cost of fossil fuels The Energy-Return-On-Energy-Investment (EROEI) is such a tool. EROEI reveals the net energy derived from a project after deducting from the project’s estimated life-time output all costs of planning, construction, fuels, ongoing operation and decommissioning. Many energy industry experts and international bodies such as the IEA (International Energy Agency) see the solution to our coming exhaustion of oil reserves in returning to, or in stepping up, the use of liquid natural gas, of nuclear power, coal or oil derived from shale or tar sands with lower marginal energy returns than oil. These energy sources offer little hope for solving our problems on a long-term basis. Take natural gas: like oil, it faces exhaustion of resources and add greenhouse gases into the atmosphere. In most OECD-countries gas production has peaked and is on the downward slope. The IEA’s favorite energy sources of the future, oil sands and shale oil have a restricted role in the future. A number of companies working in this sector showed huge cost overruns  or fell into bankruptcy . The core of the problem is the low energy-return-on-energy-investment (EROEI), combined with a huge demand for water, polluting rivers, landscapes and ground water, not to talk about multiplied emissions of CO2 and air pollutants. Even with subsidized oil extraction form oil sands, these resources will play a marginal role in replacing conventional oil when new renewable sources with higher EROEI and lower cost will step in. For years now we hear of the “Renaissance of Nuclear Power”. But market shares of nuclear power are dwindling — and where are the advantages? The high costs of nuclear power have not disappeared since the sixties and seventies. 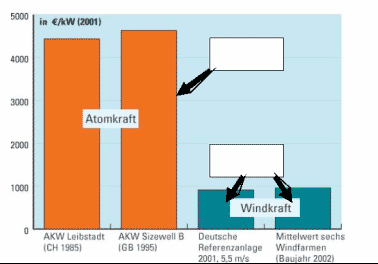 Even the pro-nuclear Bush Administration admits that the costs of nuclear energy exceed those of wind energy, for example. Moreover the hidden costs of nuclear power are not going away: costs associated with nuclear radiation and accidents, misuse of bomb material, terrorist attacks, lack of liability insurance and the issue of radioactive waste. On purely economic grounds, nuclear power has no easy standing in competitive openmarkets like in the European Union  and will barely grow without subsidies over the coming years . Billions of subsidies are needed to keep nuclear power plants going , to clean up old facilities  and even more money to construct new ones. These huge investments offer no hope for cost reductions to an extent observable for renewable energy . Nuclear energy is viable only in state monopoly structures where initial costs for capital and fuel conditioning, decommissioning and insurance are transferred to state bodies and paid for by the tax payer. That nuclear energy is a huge source of financial losses is becoming ever clearer the more the power grids are open to competition and the more electricity monopolies get vertically unbundled. Aside from the fundamental lack of profitability there are the unmeasurable costs of human tragedies such as Sellafield and Chernobyl. 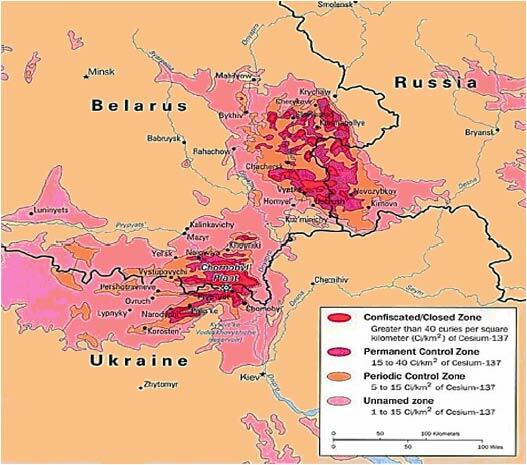 In the latter case 2.5 million people are living today on contaminated area, with rising morbidity of children and a range of new, terrible diseases . The phase-out of nuclear power on economic terms has begun in nations like the United Kingdom, Canada or the US. With the next middle sized nuclear accident in a Western nation, this phase-out will proceed even faster. Investors who like to put their money in energy should be aware of this. Sustainable energy solutions are those which do not compromise the well-being of future generations. That rules out all nuclear options. So will hydrogen be the future? In his State of the Union address, President George W. Bush proposed a $1.5bn research and development program for hydrogen-powered fuel cell cars. The “hydrogen economy” is even on the bestseller list; “freedom fuel” is supposed to release us from the grip of the oil barons. There are 985 organizations listed as fuel cell developers, researchers, distributors, associations, government agencies and laboratories in the U.S. alone . But properly analyzed the hydrogen way raises a lot of questions. Hydrogen is not a source of energy, but an energy carrier like batteries or flywheels, but compared to other energy carriers, a difficult one. Because of the low density and molecular structure of hydrogen, the energy needed to operate a “hydrogen economy” is much bigger compared to the energy consumed within today’s oil and gas energy economy or a properly structured sustainable energy economy based on renewable energy sources. 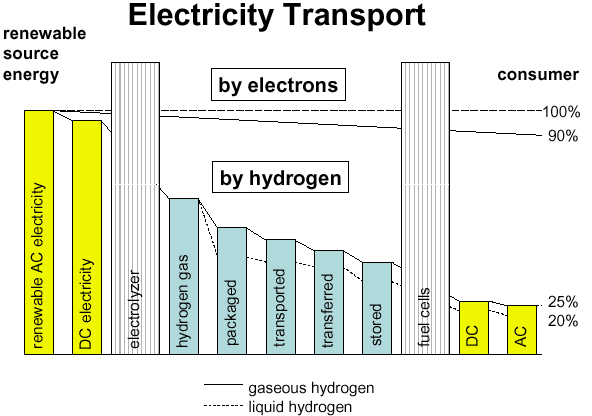 Hydrogen proponents love to cite the efficiency of the hydrogen/oxygen reaction  in fuel cells, but sometimes neglect the steps that precede it, which include the manufacture, compression, liquefaction, transport, delivery, bulk storage, transfer to vehicle, and re-expansion of hydrogen fuel. A utilization technology is efficient only if the entire process, and not only a single step within the process, is efficient. If electricity is generated from natural gas in a large unit, the associated emissions of carbon dioxide are just over 400 g/kWh. When hydrogen is produced by reforming natural gas, the emissions are around 285 g/kWh. If that hydrogen is passed through a fuel cell to produce electricity, the emissions per unit of electricity generated roughly doubled to 550 g/kWh, as the efficiency of a fuel cell is at best about 50% . In other words, electricity generated directly in a natural gas fired combined cycle plant is more effective in keeping emissions down than a fuel cell running on hydrogen derived from the same natural gas. It is a fundamental fact of physics that converting energy also consumes some energy. This dictates that we limit conversion steps to situations where they cannot be avoided. Using electricity from renewable energy sources — wind, tidal flows, sunlight, geothermal heat — to break down water in order to get hydrogen for fuel cells to convert it again into electricity is a wholly uneconomic detour. In all applications, hydrogen energy would compete with its source energy. These original energy carriers can be delivered to the customers much more efficiently in their original form than by using them first for producing hydrogen. In summary, for purely physical reasons hydrogen will always be more expensive per energy unit than the energy source used to produce it, and because losses are huge, hydrogen must be put in serious question of solving our energy problems in an economic way. Superior solutions do exist for tackling most energy problems. The economic implications of this are important. Economic viability is as much part of sustainability as the development of clean, safe technologies and secure supplies. If a hydrogen economy may ever be coming, it will most likely resemble the perfume economy, a market where quantities are so small that unit prices do not matter. It might start with cellular phones or laptop computers, where consumers do not mind paying $10 a kilowatt-hour for electricity from fuel cells, but the options for hydrogen in a global energy market seem very restricted. European Commission Union members Loyola de Palacio and Philipp Busquin followed George W. Bush’s call for hydrogen and devoted some 500 million euro  to a European Hydrogen Program. More programs covering almost 3 billion Euros for hydrogen from fossil fuels with CO2-sequestration and “hydrogen communities are to be followed. So why are international research organizations so fixated on the introduction of a new energy carrier rather than solving the actual problem: reduction of energy consumption by rational use of energy and by utilization of clean and domestic renewable energy source? The hidden aspects of this focus on hydrogen deserve to be illuminated. When the European Commission and various scientists declare that “Hydrogen opens access to a broad range of primary energy sources, including fossil fuels, nuclear energy and increasingly renewable energy sources” the sequence of wording is revealing: fossil resources first, then nuclear, renewables later or maybe never. The hydrogen research budget of the Bush administration comes at the expense of support of renewable energy and of energy efficiency . Wind, biomass, geothermal and efficiency research all lose support. The funding of hydrogen is provided to fill the coffers of nuclear and fossil fuel companies and car makers. They are supposed to produce “clean” hydrogen on their grounds. The hydrogen campaign is very generously funded by governments and cleverly managed by fossil industries and nuclear. They have hijacked hydrogen for their own gains, with cynical disregard for the economic and environmental downsides of elbowing renewables out of the way. 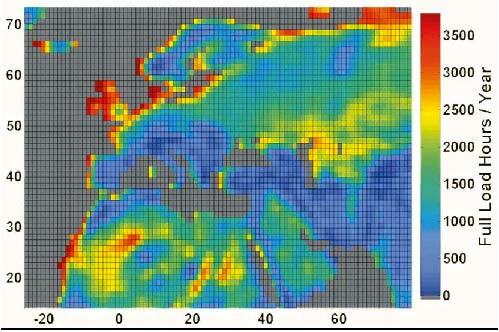 Today the efficiency gaps of hydrogen are clearly identified . You need four times more primary renewable energy to run a hydrogen system than using electricity directly from wind turbine for example to delivery point. Economics implies avoiding all unnecessary energy conversion steps. Compare modern society and its growing scarcity of cheap oil with the functional system of a rain forest. In a rain forest you have extreme mineral scarcity and a huge diversity of specialized organisms find their way of living in recycling and managing materials with solar energy, recycling materials and heat. Our own society must turn away from non-sustainable nuclear or chemical fuels like coal, oil or gas and satisfy its energy demand primarily from sustainable “physical sources” like electricity derived from solar, wind, water, ocean waves or geothermal heat, supplemented by biomass from natural growth and organic waste. We have both an immediate and a long-term source problem. However, in recent years we have developed and matured a variety of commercially available technologies to relieve it. Wind, solar, geothermal and biomass truly are energy sources with a positive Energy Return on Energy Investment (EROEI). For wind, for example, the EROEI is in the range of 80 to100 . Renewables require an energy investment before they generate a usable fuel. These up-front costs may be quite high, but on a life-cycle basis they are more and more affordable, for there are no fuel costs. Thus, with renewables one attains a high degree of cost stability in an environment that is increasingly volatile. The ongoing flow of primary energy is essentially free — save for maintenance on and for amortization of the equipment costs. Wind energy is a textbook example for the energy potential, the cost development, and the speed of market introduction that soon could be reached in other fields like geothermal, biomass or solar photovoltaic energy generation. The potential of wind power is indeed enormous: All the electricity consumed by the former European Union (EU-15) could be produced, with two 5 MW turbines positioned per km2, in an offshore area of 200 km x 200 km, shown by the polygon in the left half of Figure 17 around the so called Dogger Bank, an extensive flat sandbank between England on the west and Denmark on the east, with a depth between 18 and 40 m only. For stability of supply one will of course avoid putting all these turbines in one place; a more decentralized location strategy with variety of renewable sources will be more practical. Recently, wind power enjoyed dramatic cost reductions. In many locations the generation cost of electricity from new wind power plants are lower than those of new coal or nuclear-fueled plants of equivalent-capacity. Compared with natural gas-fueled plants, European wind power installations deliver energy at equal cost. 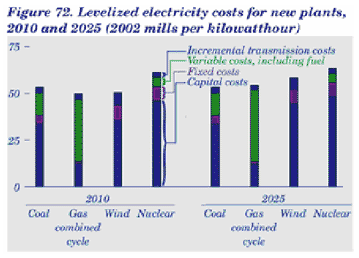 In the US the cost advantage for wind is even greater. The economics of wind power are remarkable: investment costs of fairly less than 1euro/watt, short building times (2-20 weeks), winter and summer production peaks (depending on location), global availability, no emissions, no fuels and disposal costs, low maintenance requirements and steadily falling generation costs thanks to increasingly efficient installations and mass production. Wind power is fully immune to oil and gas price fluctuations. Wind hedging is gaining in importance on the US power market because natural gas, the widely preferred power plant fuel supply, is declining and experiencing alarming price rises and fluctuations. Maps of European wind conditions reveal that the continent’s present electric power consumption could be supplied 100-fold with onshore installations alone; offshore installations add enormous additional capacity. Denmark, Germany, and Great Britain are eagerly developing these technologies for delivering clean, inexhaustible electric power that is inexpensive after the initial investment is amortized. The full replacement of conventional electric energy by renewable-source energy is possible, promising lower costs than today’s fossil-fuel derived power, not to speak of energy from new nuclear facilities . Despite their compelling advantages, new renewable energy sources are consistently ignored as being economically viable by such organizations as the IEA. In its World Energy Outlook 1998 the Paris based intergovernmental body predicted that by 2020 a total of 45 GW of wind power capacity would be installed. The reality is that wind power in the last five years to 2003 attained a yearly growth rate of 26 percent and is the fastest growing generation technology worldwide. 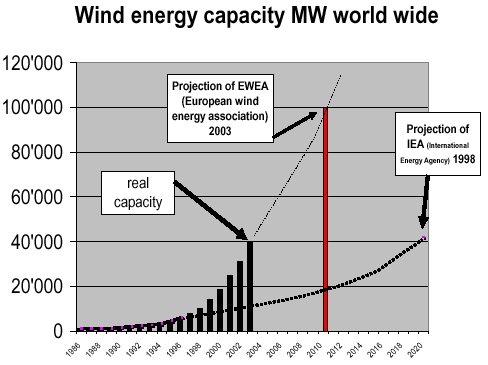 By 2003 the installed capacity already reached 39 GW, and the 2020 goal of 45 GW will be attained in 2004 . It is not a coincidence that wind turbine and photovoltaic companies experienced extraordinary sales for years now, and they are expected to translate these sales into solid market share gains .Sinking cost and a good balance of output versus input are strong positive arguments for most renewables. That’s why renewables are called a source of energy — the energy returned is greater than the energy invested. By contrast, an energy carrier is not a new source of energy, but an energy sink. Renewable energy is harvested as electricity, heat or chemically as biomass. 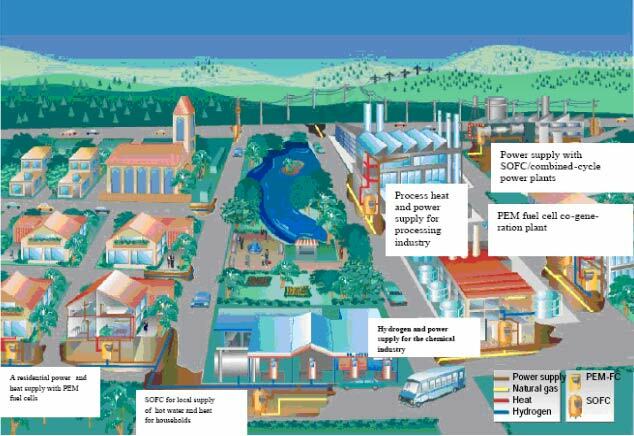 Of these, electricity can be transmitted to the user and converted to energy services with highest efficiency. Energy losses are least if transmitted by High Voltage Direct Current (HVDC); losses are as low as 4% over a transmission distance of 1000 km. With grids accessible to all, energy producers can compete with little concern for the actual distance to market. Wind farms in Russia or Ireland, hydroelectric peak power from Switzerland and Norway, and solar farms and wind from Mediterranean countries will eventually contribute to a stable electric power supply in Europe. Similar continent-wide interlinks could be realized in the US and other parts of the world. No other energy carrier can beat electricity from renewable energy with respect to efficiency, environmental friendliness and low cost of transmission. Consequently, electric power should not be converted to another type of energy until its final point of use. Today, research seems to be hijacked by people like George W. Bush who believe that after oil — a chemical energy resource — we again need to resort to a chemically stored form of energy. But upstream resources will shape downstream infrastructure. The internal combustion engine or oil burning furnaces were a logical outcome of fossil resource. The outcome of renewable energy sources will be different. Physics and economics must lead our way, to a lesser extent political frameworks and directives. The laws of physics cannot be changed by majority votes of political bodies or by announcements of a president. Renewables will succeed because of their high “source-to-service” efficiency. The sooner, the better. It’s good for all of us. It was pointed out that hydrogen is less efficient for stationary uses than direct use of electricity or of heat from renewable energy. So what about hydrogen for use in mobile appliances? Here too, the most efficient solution is obtained by an efficient conversion of high-grade mechanical energy into high-grade electrical energy or by converting the hydrocarbon molecules of biomass into hydrocarbon molecules of liquid fuels. In both cases, energy is not converted across the border between physics and chemistry. The transformation of biomass into methanol or ethanol or the creation of synthetic fuels by processing biomass hydrocarbons creates fewer losses than the conversion of biomass or electricity into hydrogen when all aspects of the energy market are considered. On a volume basis, these fuels store more energy than hydrogen. They even contain more hydrogen than liquid hydrogen itself or hydrogen gas compressed to 800 bar. Biofuels are traditional hot topics, but battery cars and compressed air cars deserve a closer look than hydrogen. The French designer, Guy Nègre is developing cars with air expansion engines. Compressed air is expanded in four cylinder piston engines to provide power for vehicle propulsion. Compressed air is not a new energy carrier, but it is the first time that a modern compressed air vehicle has been designed. Compressed air cars have some positive attributes: Air motors are small and lightweight for the power they produce, and also substantially cheaper; compressed air tanks can be refilled much faster than hydrogen tanks or batteries. They last almost indefinitely with any number of recharging cycles and without losing capacity. The engine can be made from lightweight aluminum, because it is operated near ambient temperature. As to cost and density of stored energy, it’s hard to say what the driving range of compressed air or battery cars will eventually be. Experts on battery cars claim that 300 km are possible with up-to-date battery technology (Lithium-Ion) at no prohibitive cost. it is by no means clarified if fuel cell cars have a better driving range. For this range electric vehicles will be superior to hydrogen fuel cell cars with respect to initial costs and overall economy. This aspect should be recognized by the hydrogen fuel cell community. 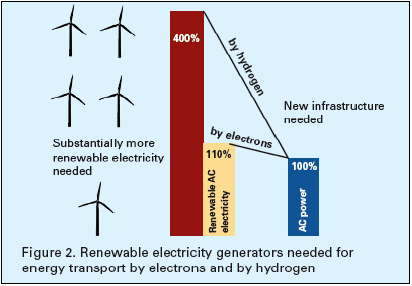 In any event, if renewable electricity from solar, wind or hydro is available from a 90%-efficient intercontinental power grid, and air tank or battery losses (loading-unloading) are in the range of 20 percent, and recuperative braking is applied, an overall car efficiency of 50 percent or more appears attainable — a great leap from today’s gas guzzlers or from hydrogen car’s “well-to-wheel” or “power-plant-to-wheel” efficiency in the range of 9 to 22 percent . Hydrogen proponents point out that the low driving range of electric cars will not be accepted by consumers and that battery and compressed air systems are not getting mature. This evidently was true in an economy with very cheap gasoline. But with higher prices and with the growing success of the Toyota Prius, things could turn out well for electric vehicles (EV) very fast. There has been some disappointment expressed that battery technology for electric vehicles hasn’t progressed nearly as much as had been hoped. The reality is that battery technology has progressed significantly in the last decade. But vehicle manufacturers haven’t been applying that technology in new products . So with rising fuel prices expect these technologies to be adapted for automotive use. The Prius includes most of what is needed to make a basic EV — electric drive-train, electric power steering, electric power brakes, 4-door lightweight body, low rolling resistance tires, all for a retail price of $20,000. Considering the lack of hydrogen fuel stations and the easy access to electricity, driving with batteries or compressed air could soon be a better choice that could be developed without much additional research or nation-wide new infrastructure. Think about a good battery and a battery maintenance network at reasonable cost, maybe with permanent service and ownership of the battery by the car maker. In any way it must be pointed out that cars driven by hydrogen electrolyzed from electricity show a much bigger consumption of energy than today cars. Such a strategy for cars could only be viable in the case that abundant cheap and clean renewables were available. If hydrogen is derived from fossil fuels, CO2 emissions will grow higher than with today’s car fleet and would be very much higher than with bio-fuels, battery cars or compressed air cars. The electric vehicle turns out to be far more efficient than any fuel cell car; even more when the weaknesses of batteries are eliminated and confidence into a service network would be built, by reasonable guarantees for ranges and life-time of such appliances. Also, there are opportunities for using a wide range for using biomass-derived fuels like ethanol, methanol or synthetic bio-fuels in automotive fuel cells. And let us not forget electrical rail transport — a highly efficient means of mobility for personal and freight traffic that could solve a number of problems in urban areas; air pollution, excessive noise, road construction and maintenance, traffic congestions and losses due to accidents. Hydrogen as a Storage Medium for Renewables? In the not so distant future renewable energy sources will contribute a sizable percentage of power to the integrated power grid, even if developed within the conservative visions of current energy policies. Fortunately, the reality is ahead of politics. The need for new energy storage schemes and load management becomes apparent. However, electrochemical energy storage with batteries or hydrogen using reversible fuel cells will not necessarily be the most practical or the most economic solution. Physical energy storage systems appear to be the better solution. Electrical energy is best stored in electron storage devices like super capacitors, as potential energy in hydro power storage facilities, as pressure energy in compressed air storage tanks, by ultra flywheels  and alike. But above all, much energy can be stored in form of useful energy (e.g. ice reservoirs in refrigerators, heat reservoirs in buildings). Furthermore, HVDC transmission lines can carry electricity from regions of oversupply to regions of shortages to balance differences caused by weather or daytime changes . Also, wind energy generators can be easily stopped if the stability of the power grid is threatened by too much wind in one area. This requires that the installed wind power is above the actual power requirement of the grid. All these physical energy storage and management schemes compete in economic terms with equally clean hydrogen storage solutions. The dwindling fossil fuel resources come in as an additional source for capacity management: It might soon be more economical to spare natural gas for capacity management in integrated wind driven grids than to burn it as prime energy source in thermal base load power plants. As long as certain amounts of fossil fuels are tolerated and used, it seems better to use them for this purpose rather than to convert them to hydrogen to replace fossil fuels in the transportation sector. Why take the long and expensive way detour when the short and less expensive straight road can be used? Hydrogen does not provide a solution to the energy problems we face today, and, in all likelihood, it will not do so in future. The Bush Freedom Fuel Initiative will have the overall effect of creating a hydrogen economy with more of the same old fossil fuels. Rather than reducing the overall CO2 levels this solution would only shift the emission of pollutants from one activity to another and from one location to another, but the emission of greenhouse gases would grow faster than ever before. We really should put hydrogen aside and look for economical and risk-free, clean technologies that are readily available. Oil was the principal driver of our economic prosperity. Renewables and electricity will be the keys for the future. Electricity is the most efficient power source for trains, fixed route transport and homes. Electricity is the most effective power source for illuminating, especially with the emerging LED technology. Communication depends almost entirely on electricity. Electricity could be used with high efficiency for space heating if electric heat pumps were used together with solar energy heat sources. In a future “Electron Economy” based on electricity from renewable sources, electric heat pumps could become real “energy multipliers”, while the replacement of natural gas by synthetic hydrogen in stationary gas heaters would lead to an intolerable waste of energy whilst requiring a two-and-a-half fold increase in the conduit area sizing of the existing natural gas pipe grid. As we leave oil behind as our dominant energy technology we will more and more convert our energy system from a chemical to an electrical base. Electric power will be the reference energy against which all other forms of energy will be compared. The cost of synthetic hydrogen will be compared against the cost of electricity needed to obtain this hydrogen. It is clear that this hydrogen is more expensive than the electricity “burned” in producing it. Applying the principles of this simple comparison may well lead to new technologies focused on energy use more than on energy production and distribution. Engineers will make choices that are quite different from those made a generation or two ago. Electrical systems with their proven high efficiencies will gradually displace chemical energy conversion systems saddled with inferior efficiencies. Efficient electric systems will replace inefficient chemical energy converters like thermal power plants, IC engines or fuel cells. This is not a vision or personal view, but it is directly related to the physics of the future energy supply and the necessity for rational use of the energy mankind is able to harvest from renewable sources. Energy production will become more regional. Wind energy and biomass conversion offers a certain measure of choice on where and when to produce electricity. Wind farms are located on the basis of decisions that take account of where suitable wind conditions and land are available and of where customers are. By contrast, there is no choice possible on where to locate an oil field — it must be where the oil deposits are, and that may be half a world from where most customers are. The enormous infrastructure for transporting oil and gas will take on diminished utility in competition with super-efficient HVDC systems for bringing electric energy to industrial and personal consumers. 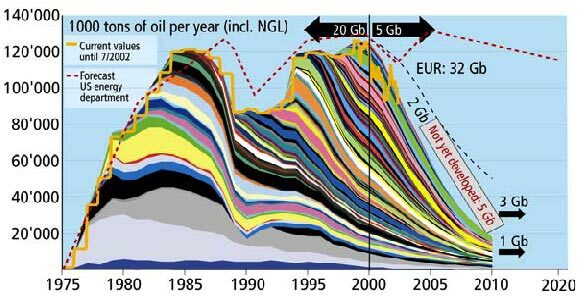 By 2050 we might not be transporting energy as chemical commodity at all. Instead we will transport energy as pure energy itself.